The investment in education is an investment in human. The investment helps individuals develop their potential and enhance the competitiveness of the whole country. The funding for education provides energy, enabling the education system to operate continuously. To develop and maintain the sound operation of education, that the central government formulated the Educational Fundamental Act to regulate the budget of education should be protected by the law. To implement the budget of education protected by the law, the Ministry formulated the detailed Rules Governing Management of Educational Spending, which involves planning, preparation, protect, and review of education budgets. Obviously, the government pays much attention on investment in education. In recent years, despite some considerable growth on education budget, but there are a number of problems in the distribution, such as the high percentage of personnel costs, the burden of the retirement funds, the dramatic increase in legal and compulsory expenses. Those heavy expenses will affect the general and compulsory education expenses. Therefore, how to tackle the transformation of the education budget and financial system, and effectively improve the distribution of the funding for education, is our urgent work. The dept is a unit under the Ministry of Education (MOE) responsible for finances. It is the dept’s duty to work with the ministry in an effort to achieve the goal of assisting accounting administration. According to MOE Organization Act amended February 3, 2012, Accounting Dept is responsible for handling budgetary, auditing, and accounting matters, and for supervising accounting personnel. In the dept, there are one director, one deputy director, and two senior executive officers. The dept comprises four divisions. Teaching hospitals & public schools division in charge of planning, preparation, and review of budgets of teaching hospitals & public schools under the ministry. Private colleges, universities &accounting personnel division in charge of budgets and financial statements of private schools, personnel of public schools, and the dept’s miscellaneous affairs. Internal examine & approve and bookkeeping division in charge of review of ministry’s spending and budget control. 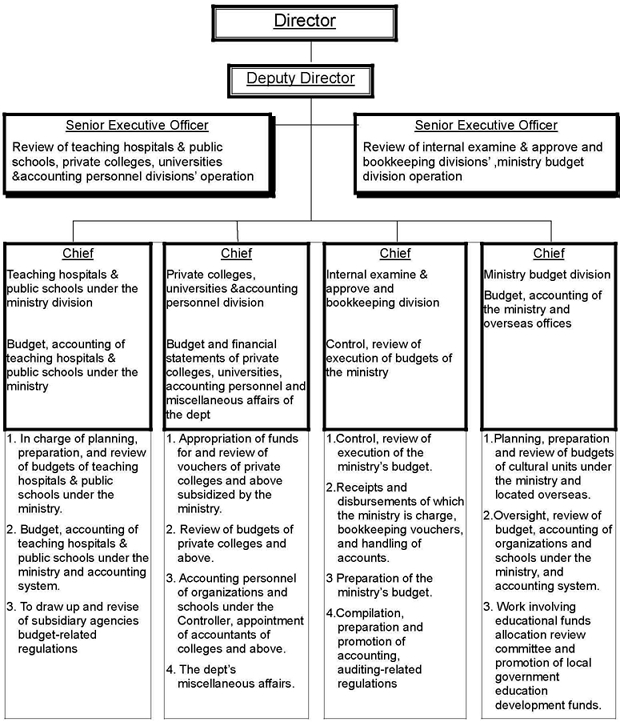 Ministry budget division in charge of unit budgets (including overseas offices) supervised by the ministry.